The CCHS debate students traveled to George Mason University for a national debate competition from November 30th to December 2nd. On Friday, November 30th, students boarded a bus to the airport and flew to Fairfax, Virginia. For most students, it was their first time competing in this tournament, however, for some veteran debaters it was their second time going. Competing against students from all the over the country, the debate students had to put in a lot of time and preparation. The Lincoln Douglas and Public Forum debaters really shined. Lincoln Douglas is a one on one debate match, while Public Forum is two on two. 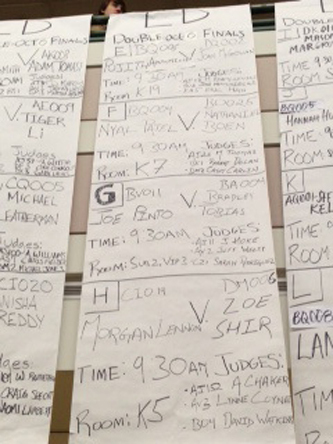 Zoey Shir, Lincoln Douglas debater, moved onto the round of 16 and Public Forum debaters Arthur Kulawik and Justin Lewen, moved on to the round of eight. “It was really cool to see students from all over the country and see their viewpoints, and try to change them through debate,” junior Michael Garcia said. The 2nd day of the trip was a respite from the first demanding and long day of competition. The debaters went to Washington D.C., where all of the important decisions in our country are made. There, students visited all of the national monuments, the American History Museum, and the Museum of Natural History. Finally, the CCHS debate students returned home Sunday night after a job well done. Hopefully, the students that went to GMU can encourage other students to go next year and have the same great experience. “We usually go to these tournaments for our varsity members so they can get a better feel for what the competition is like and to see what it’s like to debate on a national level,” Debate Sponsor Melvin Tanner said.